'Where there's smoke, there's flavor!' This is a well-known expression in the smoking meat circles. Another popular tag line is 'low and slow'. One more popular one is the 'smoke ring'. Each of these expressions say a little bit about what smoking meat is all about, tasty flavorful meat with unmatched tenderness. In this method of grilling, also called smoker cooking or smoke roasting, the heat is as far as it can be from the food. The food is cooked with indirect heat. The fire can be all the way at the bottom level with the meat at the top in a vertical setup, with a level of smoking wood and water in between. The challenge is maintaining the recommended temperature and keeping a smoke-flow, so, for the smoking beginner, a well sealed electric smoker is a good starting point. The smoking method is usually reserved for larger pieces of meat. The beef brisket, ham, ribs, turkey and lamb are strong contenders in this grilling method, using smoke. You can smoke cheese and vegetables too. ‡ Only the heat from steam is directly applied to the smoking food. Obviously the steam is generated by using other conventional heat sources. Grillspot Tip! - Smoke pre-cooked foods like ham, turkey or chicken and save yourself cooking time and food temperature woes! Check product labels on how the food was pre-cooked to avoid over-smoking. 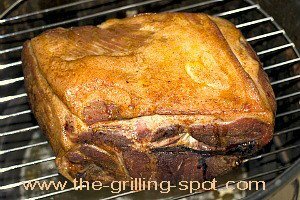 For the handy cook with some experience, knowledge, a little research and some tools, it is possible to customize and adapt a regular grill with a cover to smoke any type of meat. Avoid materials like galvanized steel and others not intended for cooking. Chemical residue contamination can occur. Question - During meat smoking, when is the smoke absorbed? Most of the smoke is absorbed in the first hours of smoking as most of the juices are later lost and the meat 'caramelizes'. Less smoke is absorbed during the latter part of smoking. The pink color visible on smoked meat slices is not a sign of uncooked meat. It's a 'smoke ring', the bragging rights of a good cook! Some meat smokers have a chimney to convey excess smoke out while others simply have vents or dampers or a combination of both. The main focus in smoker cooking is for the smoke to encompass the food as it cooks, the food gets a 'smoke bath'. Not too much, just enough to flavor your meat. Allow the air in the smoker to circulate, crack open the vents for smoke to escape. Do not allow the smoke to stagnate. Maintain a 'smoke-flow'. Question - How long can I smoke my meat? Generally, smoke for 1½ hrs for each pound (approx. ½ kg). Start out with a handful of smoking wood. Keep one of the top vents open. Maintain water in the pan. Check internal temperature. Keep a ledger or record for future reference. Intense smoking, especially with some woods, like cherry, can soot the food and ruin the whole experience. You don't want that acrid flavor reminiscent with over smoking.... The temperature is low so that the heat can cook the meat slowly. The result should be unmistakable woodsy flavor coupled with very tender meat. 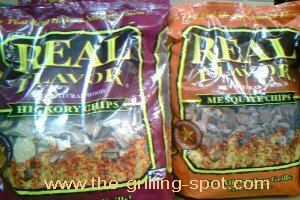 The smoke comes from flavor woods in the form of chips, chunks, pellets or dust. Each of these forms of wood used for smoking is suited for a range or a particular type of smoking appliance. It all depends, you can put it in a dedicated smoker box, pan, hot plate or over burning coals. You have a wide selection of wood flavors to choose from. 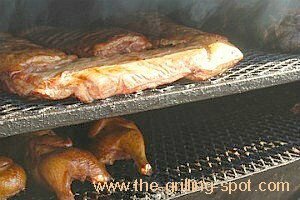 Hickory and mesquite wood are very popular for smoking meat. The wood of alder, oak, pecan, maple and other fruit trees like cherry, plum, apple and peach are widely used for smoking as well. Try soaking your wood chips for 30-40 minutes and allow them to drip-dry before introducing them to the fire. Try out different wood flavors first, making a note of the wood type and amount. Mix and match or blend different woods to produce 'new flavor'. Always start with one wood chunk or a handful of chips of a new wood flavor and then venture out in quantity and variety as you discover, register and monitor your favorite flavor. Soaking chunks is unnecessary. They absorb little water and take long to burn anyway. Question - What is the 3-2-1 method in smoking meat? It is smoke, wrap, then smoke. This simply means that you smoke the bare meat for half the total smoking time, smoke in foil for a third of the smoking time and remove the foil and smoke bare for half of the 'foil-wrap' time. If you are handy or good with numbers, this is what to do - divide the suggested total smoking time by 6. Take your result or answer and multiply by 3, then 2, then 1. The three times you now have are the new 3-2-1, bare, foil-wrap and bare smoking times. Let's start over. Assume total recommended smoking time is 60 minutes. Divide by 6, we get 10 minutes. Multiply by 3, we get 30; then multiply by 2, we get 20; and lastly, multiply by 1, we get 10 minutes. Our new 3-2-1 time for bare, wrap and bare again are 30 minutes, 20 minutes and 10 minutes! Phew! The foil helps to keep the meat moist as it cooks. This method works to achieve very tender food even with tough meats like ribs. There are numerous types and sizes of meat smokers with many heat sources. There are small portable smokers, large or medium-sized, and even large trailer-drawn entertainment and competition style smokers. Talk about charcoal, wood, gas or electric, you have it all. With all these variations, a grill cook has to be 'one with his equipment' in order to achieve desired results from smoking foods. Here are some smoking tips to use for smoking meat and poultry. Feel free to customize to suite your taste and preferences. Do it your way and feel like a King; or Queen. 1. The amount of water in your pan affects the smoker temperature. Maintain it at ½ inch in the water pan to keep your food moist. Always add hot water. 2. Try using other liquids like apple or pineapple juice or even beer instead of water in the pan. If you want to use water, you can add slices of fruit, onions or fresh dried herbs in the water to blend different subtle flavors into your smoked food. 3. Introduce just a cup of pre-soaked chips or just one wood chunk into the fire. 'Feel' your way to your best flavor and smoke intensity. 4. Have a grilling notebook to record quantities, smoke times, wood flavors and different blends, types of meat or poultry, ingredients and other pertinent information as a point of reference for your next smoking session. 5. Wrap meat and poultry in aluminum or tin foil and let it rest for 15-20 minutes after smoking to allow the juices to re-distribute. Later on, carve and serve. 6. Brine the larger leaner meats especially chicken and turkey overnight or 1-2 hours, in the refrigerator, before smoking. Beef, steaks, ribs, drumsticks and thighs and many chops do well with spice rubs, brushing and mopping. 7. Try the following ingredients for smoking brines; salt, sugar, rosemary, thyme and black pepper in water. Add a table spoon of vinegar to chicken, turkey, other game with full flavor meats and poultry to reduce that strong chicken smell and taste. 8. Look for well marbled meats with a good layer of intra-muscular fat. Trim off and leave at least ¼ inch of fat to keep it moist as you smoke it. Try leaving all the fat on and trim off after smoking. Not a rule. Just a suggestion. Grillspot Tip! - If the fat is harder than the meat, trim it off, it may not melt. Smoke your meat fat-side-up! 9. If using a charcoal smoker, light up only half of the charcoal you will need and add the rest of the unlit charcoal to start your smoking meat session. This helps to reduce the number of times you will need to add charcoal. It also helps to keep the temperature at the recommended levels for your smoker. 10. Maintain smoker temperature between 200-300 °F (95-150 °C) for perfect meat smoking depending on the meat or poultry. Start smoking only after recommended smoker temperature has been reached. There are two 'temperatures' in smoking. Grill temperature and food temperature. 11. Thaw meat and poultry in the refrigerator. For 'rush-thawing' put it in a bowl of water for an hour if necessary. Use a water-tight plastic bag, completely submerged in water. Drain and put in smoker promptly. Cold refrigerated meat in the smoker with low heat is a health risk as bacteria grows quickly at the Danger Zone of 40-140 °F (5-60 °C). 12. Reduce the number of times you open the lid. A large amount of heat and/or smoke is lost and cooking times are extended. Use a probe thermometer in one of the vents to check temperature if your smoker is not equipped with one. Most grill thermometers are not accurate. Extra Grillspot Tip! - Avoid opening your smoker to 'look'. Looking is not cooking ..... Work smart. Combine tasks. When you have to open the smoker, use that time to check food temperature, check and add water, add charcoal and smoking wood or chips. 13. Avoid applying sauces until the last 30-15 minutes of smoking. Sauces tend to burn and brown quickly acquiring a 'burnt' flavor. 14. Use a meat rack in a pan to allow smoke to wrap the food so that the food gets a smoke bath. This will also allow the juices to be collected for further creative applications. Get your creative juices flowing! Sauces, gravy, mopping, dressing .... Find the rack at your local gourmet, barbecue or department store. 15. If you are using marinades to mob your smoking food, bring the marinade to a vigorous boil for one minute first, then apply. Keep it warm on a side burner until you are done. The 'rule of thumb' with most marinades is to discard it and not to re-use. 16. Remove skin from the 'bone side' of ribs to allow more spices and smoke to penetrate. Use your fingers to pinch the skin and use a strong thin tool, like skewer to pull it back all the way. Work slow and steady. If the skin slips off, use a sheet of paper towel or a clean piece of cloth to grab it. 17. Use mustard, butter or olive oil on your meat and poultry as a bonding agent before you apply your favorite rub. Use the '30-minute refrigerator-to-smoker time' time to apply the rub. Question - What is caramelization? In grilling, caramelization is a complex process where, after heat is applied to food items, the sugar in the food is broken down. The result is brown colored food and a sweet flavor. 18. If you are using a gas smoker or an electric smoker, consider using lava rocks and ceramic briquettes, respectively, to help in maintaining the temperature of your smoker. Put them around the burners or the heating element 15-20 minutes before smoking the meat or poultry. 19. Consider searing your tuna fish and cuts like tenderloins and steaks over high heat in a skillet before introducing them to the smoker. Searing seals flavor and give your food cross hatches or grill marks, if you are using a ridged cast-iron pan on high heat. Searing also gives food a crusty 'caramelized' surface. 20. Know your smoking meat and poultry before smoking. Some are 'full-flavor' meats and can take heavy smoking. Beef, lamb, turkey and ribs can take a good smoke bath. Use gently smoldering wood smoke with venison roasts, veal, chicken, pork and fish. You will find many more useful grilling tips here. Would you like to add a time-tested meat smoking tip? This is an intense, smoking and meat preparation technique at low temperatures. The goal is to enhance the flavor of meats, vegetables and cheeses and to improve preservation. The heat applied to the foods is low, typically below 120 °F (50 °C). A lot of brining and salting is done before smoking to prevent the growth of bacteria and to improve the quality of cured food. This type of smoking is prolonged and takes up to days, even weeks. The end result is dry, salty, flavored food. Smoke-cooked meat is not 'cooked' and most should be refrigerated until they can be fully cooked. A good example is smoked bacon and smoked salmon. Carefully check the cooking and preparation instructions. Pay attention to the expiration date too. Consume smoked foods in moderation because sodium levels can be high. As a result of all the above conditions, cold smoking is usually the domain of experienced cooks in a fully fledged smoking facility. Follow these simple guidelines for smoking meat to a safe internal temperature. Smoke beef, veal, lamb, steaks, roasts and chops to a safe temperature of 145 °F (65 °C). Smoke all pork cuts to a temperature of 160 °F (70 °C). Ground meats have a larger surface area and should be cooked to a higher safe temperature of 160 °F (70 °C). These meats include beef, veal and lamb. Smoke tender meats like fish, seafood, veal and chicken at lower grill temperatures of between 200-225°F (95-110°C). All poultry should reach a safe internal temperature of 165 °F (75 °C). For food safety reasons, there is no rare or medium-rare cooking categories for poultry. All smoking times are an estimation. Weather, size and type of meat or grill, type of fuel and other factors affect the grilling and smoking times. If the recommended food internal temperature is reached stop smoking. If smoking time has been reached before the safe internal temperature, keep smoking. Refrigerate smoked foods no later than two hours after smoking. Cut up large pieces into smaller manageable pieces and put into plastic bags or containers in the refrigerator for 3-4 days. If longer, freeze for later. Remember, where the is smoke.... there is, not fire, but good flavor! Follow these simple guidelines and have a fun-filled and tender meat smoking time!